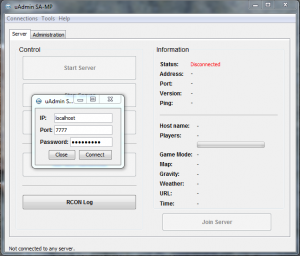 uAdmin: SA-MP is a GTA: San Andreas Multiplayer server administration program, which enables you to issue RCON commands to and retrieve information from a server. To open the program double click uAdminSA-MP.jar (make sure you have Java correctly installed). 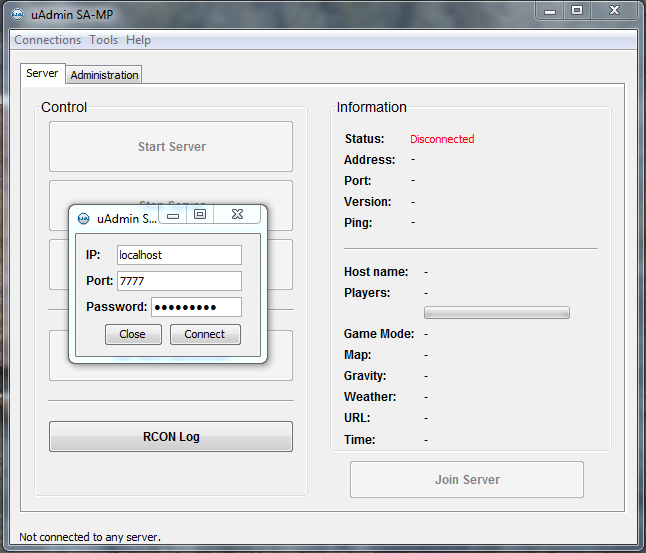 The program will create a settings.ini file which should be located in the same directory as uAdminSA-MP.jar. You might then want to edit your settings by going to the “Tools” menu and click “Settings”. If you want to run a local server you need to set up the server directory and if you want to use the “Join Server” button you’ll also need to check your game directory. Once you’ve sorted out your settings click save and restart the program. To connect to a server press Ctrl+C or go to “Connections” then click “Connect”.